I think we’re finally nearing the end of our green bean and tomato harvest. Even after eating them frequently for weeks on end, I still haven’t tired of them. One of the reasons, I think, is the fantastic Nicoise-style salad that I make at least once a week. Sometimes I just combine all the ingredients in a salad bowl and toss, but most often, especially when that’s all I’m serving for dinner, I prefer to serve a “composed” salad, arranging the various ingredients aesthetically on dinner plates. Just for fun, I changed things up a bit the other day. 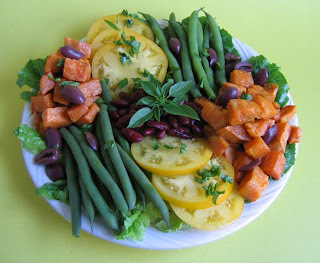 I came up with a colorful twist on the classic salad, using roasted sweet potatoes instead of steamed white potatoes, yellow tomatoes instead of red, and dark red kidney beans instead of my usual chickpeas (which I use instead of the traditional tuna.) For comparison to the colorful salad above, I’m also posting a photo of my regular Nicoise. (This recipe is adapted from The Vegetarian Meat and Potatoes Cookbook by Robin Robertson.) The colorful adaptation ingredients are in brackets. Cut the potatoes into 1/2-inch dice and steam over boiling water until tender. Alternately, the potatoes can be tossed with olive oil and spread on a baking sheet and roasted in a 435 degree oven until tender. Season with salt and pepper and set aside to cool. Steam the green beans until tender. Run cold water over them to stop the cooking process. Set aside. In a small bowl, combine the oil, vinegar, mustard, garlic, parsley, basil, and salt and pepper to taste. Whisk until blended, then drizzle some of the dressing over each salad, or if making one large salad, drizzle on enough dressing to coat and toss gently. I just adore a composed salad. So pretty! Yummy! I've never had traditional Nicoise, only a veg version with no tuna which I absolutely loved. I've eyed your recipe in the cookbook quite a few times. Hmmm, maybe I should just go ahead and make it. I love composed salads, too, Aimee. They're like edible art! 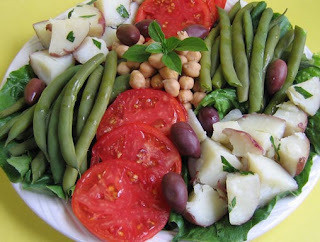 Carrie, this Nicoise-style salad is really good, and easy too. If you've got cooked potatoes and green beans, it goes together quickly. By the way, you can use your own favorite vinaigrette or just some oil and vinegar and salt and pepper. Another non-traditional addition that I sometimes include is avocado -- yum. Your Nicoise salad is gorgeous! I've been waiting patiently for my tomatoes to ripen on the vine, but I think I'll have to break down and buy some this week, so I can make a Nicoise salad. Thanks for the inspiration Robin! Your salad looks DELICIOUS! I love sweet potatoes, so I'm glad you substituted them! Making your Nicoise as part of a holiday meal based on French dishes: coq au vin for the carnivores and Nicoise for me to share with all. All the kids are coming and my DIL will be blogging on the meal. Thanks for lovely recipe!